The following are excerpts from the various testimonials voluntarily given over the years by individuals with first hand experience training in Oom Yung Doe. 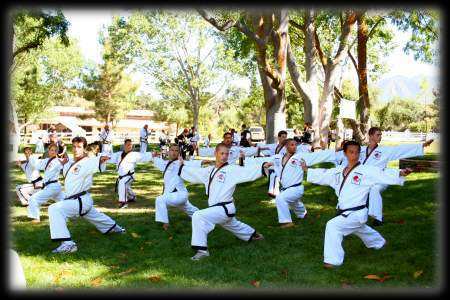 This represents only a small number of the individuals who have trained and benefited from Grandmaster “Iron” Kim’s knowledge of traditional Moo Doe. Many of these individuals have gone on to live happier, healthier, more balanced lives as a result of their experience training in Oom Yung Doe. 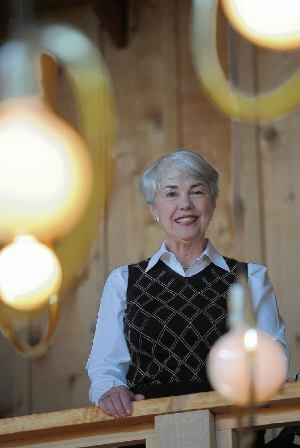 Though she describes herself as zealous when representing clients, Nancy Heilman doesn’t fight with opposing attorneys. Nor does she become upset with aggressive drivers along Route 28 during the long commutes between her home in Armstrong County east of Sarver and her Downtown office at the law firm Cohen & Grigsby. 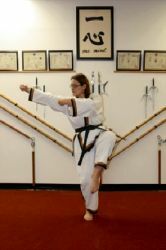 She credits her calm demeanor to nearly two decades of practicing traditional “Moo Doe” martial arts, in which she holds a fourth-degree black belt. After neck surgery my life changed. Nerve damage to both arms and a metal plate from disc C5 to C7 as a fusion made everyday tasks difficult. The range of motion in my arms was 30%, and in my neck about 10%. I was told I would not be able to do something as simple as running a vacuum, no rowing, no back and forth motions, and, if I wanted these daily motions to improve a second surgery was recommended. I passed. After 4 years of efforts from traction to steroids I was still limited and in severe nerve pain at times. It was suggested to me to join the School of Oom Yung Doe. It was the best thing I ever did for my condition. 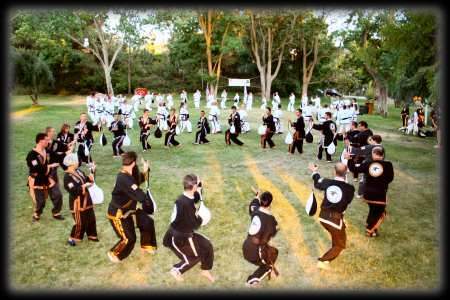 As many of you, I also questioned how a martial art school could help me. I soon realized my thinking was wrong. As my pain diminished my activity grows. Once again I can do things with ease. I will be forever grateful to the instructors with their patience and knowledge they have helped me with. The benefits gained from the School of Oom Yung Doe can be life changing for you to. 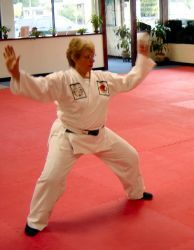 …“When I started Oom Yung Doe (7 months ago) at the age of 54, I was decidedly out of shape: no muscle tone, loss of breath from the most minor exertion, and my sense of balance was, well, off balance. In other words, I had a long row to hoe. A critical component of my development was and continues to be the school instructors and the International Level Team. Without their patience (lots of it), support, and skill in teaching the forms, I would have never made it this far. My name is Maryse, and I am 50 years old. When I joined the Oom Yung Doe School, I didn’t think that the moves I learned were going to be beneficial to me so quickly-I thought it would take a lot longer. I frequent Davis Square a lot, and I’ve passed by the Oom Yung Doe school dozens of times. Finally, one day, I decided to fulfill my curiosity, and I walked in and inquired about the school. Shortly after, I registered for a two month trial. I began the lessons, and quickly realized how much I was enjoying the classes. Not only did friends and family notice an improvement in me, but I also noticed how much more energetic I was. I was smiling more and less stressed-just genuinely happy. Not only were there mental and emotional changes, but there were physical changes as well. As I lost more weight, I became more focused. The most defining moment for me was when I fell down two flights of stairs. The lessons that I learned regarding fall techniques, I feel, saved my life. As I first started to learn how to roll, I was making faces and thinking that “Are you kidding me? I, Maryse, roll!” I thought it was something I would never accomplish, partly because I was scared and partly because of self doubt. With the careful tactics of my instructors, their patience, and their professionalism, I became more confident with my rolling lessons. The roll techniques and the “learn how to fall” lessons saved my life. The lights were out on the stair well, and I missed the first steps of the stairs. Without even giving it a second thought, I immediately changed to a roll position using my right hand to protect my neck and left hand to land on my side. As I reached the bottom of the steps, I honestly believed I had broken my neck. It took a few minutes for me to readjust myself, but I did. After a few minutes, I shifted my hand and realized that, while I was a little sore, I was ok. If it weren’t for the lessons I learned at the Oom Yung Doe School, I probably would have been severely injured, or maybe even paralyzed. Today, I learned a bit about the power of Foundation level movement. What I learned was truly amazing, and one of the more exciting experiences I have had to date at Oom Yung Doe. I recently signed up for a course specifically designed to address my mid-body strength and flexibility. As part of this course, I have the opportunity to learn a Foundation level movement passed down from the International Teaching Team. This movement is supposed to target my ability to move my hips and mid body. I was definitely curious what to expect from a Foundation movement. To be honest, the movement itself does not seem particularly remarkable to me. It is challenging, yes. But so are many of the movements I practice. Nothing about the movement was particularly striking. But when I went into practice today, I noticed a few things that really shocked me. The next shock was when I reached down to do some stretching. Despite my years of practice, I have a problem with my mid body flexibility, and normally, when I get to school, I can stretch down somewhere halfway between my knees and my toes. Once I’m warmed up, I can usually reach my toes. But today, still not warmed up at all, I reached right down, past my toes, until my fingers were entirely under my foot! Without the slightest trace of a bend in my knee! And it actually felt good! Never in my life have I done that before today. By now, I’m looking around the room to see if anybody else is seeing what I’m seeing. (Of course they’re not… I’m just stretching.) I start moving around, trying to see what else is going on with my body today, and I realized one more remarkable improvement. For the past 3 months, I have been nursing a hip injury. It was a bad sprain at first, but I was able to practice on it, and within a few weeks it settled into mostly a tightness and an ache. But it had hung around for the past few months, requiring that 10-15 minutes of slowly working into my practice to really get warmed up. But today, for the first time, there was really no sign of it. No sign that it was ever there. There were a few other moments during the practice, along the same lines. But it’s basically summed up in those stories. The fact is, my flexibility had changed pretty significantly, and in a very short time. But the most remarkable part of my experience is exactly how short a time it was. The benefits I’m describing will be experienced by anyone who practices traditional Moo Doe movements consistently. But I saw these benefits as the result of a single practice. One 30 minute session practicing this Foundation movement, and the next time I go into school I can wrap my fingers under my foot, and I can move in and out of T position in a way that has never quite felt comfortable before. To me, that is a bit difficult to believe, and hard to explain. I wanted to share the experience to show how powerful the right movement can be. This movement, for me, at this point in my training, with all the work I have done to allow me to practice it more correctly, seems to be just what I need. I’m very thankful for the opportunity to learn, and all I can say is, keep practicing hard; you never know which movement will be the key to unlock the next step on your path. I would like to tell you my story of how, I have been helped both physically and mentally by attending Oom Yung Doe classes twice a week. First of all, I am very grateful for my instructor’s patience and understanding. I am a 76 year old female and for about forty years, I have suffered with pain and limited movement in my right shoulder. About one year ago I had surgery to repair my rotator cuff by stitching the torn muscles, tendons and ligaments back together. After several months of physical therapy I had some recovery; but I still had limited range of motion in my shoulder. I also was having difficulty with small muscle control in my right wrist and fingers. 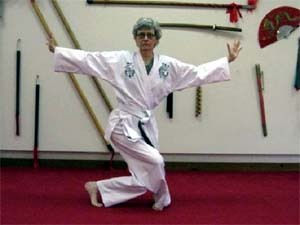 After one of my Tai Chi classes I mentioned my concerns to my Instructor. He told me that he might be able to learn movements from his higher belts to help ease the stiffness in my shoulder and ease the pain I was still having in my neck. I told my Instructor that I would be willing to try this recovery plan for me. He gave me some suggestions as to how I could use the program to improve my health; not only my shoulder but my overall health. He showed me some movements that at first were a little difficult, but within a very short period I began to feel and see improvement. After a few weeks we added a small amount of weight to the movements and I began to feel improvement in my strength. Very soon, I noticed a change for the better in the strength I had in my shoulder muscles, as well as a much greater range of motion. The next thing was to begin meditation to relieve the stress and tightness in my neck and back muscles. I also found that this technique helped relieve emotional stress. Another aid to my continuing recovery was the “Herbal Muscle and Joint Kit,” which is a paste that can be applied to ease soreness, along with a spray to further aid recovery. I am very happy to pass along the success I have had with my progress. This therapy is doctor approved. My husband, who has been a medical doctor for over fifty years, has been impressed with my improvement and encourages me to continue using Oom Yung Doe to benefit my well-being. Another benefit I have received is that I sleep better; because I am no longer awakening several times during the night with shoulder pain. Thank you so much for improving my quality of life. My name is Steve and I am a Second Degree Oom Yung Doe Instructor. 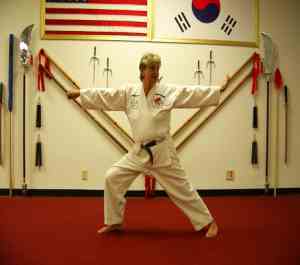 I trained in Oom Yung Doe from the age of 28 until I was roughly 35 years old. I left school to focus on other things and pursue a number of personal goals. 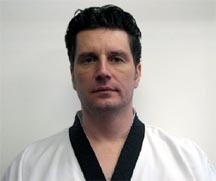 I am now 43 years old and returned to training this past September. I can’t even begin to explain how happy I am that I did. Training was always a source of strength, confidence and great health for me. However, the level of knowledge that is now being passed by Grandmaster is astounding compared to before. I am 100% certain that it will not only expedite my ability to regain what I once had from training but, it will also help me quickly move far beyond where I was mentally, physically and spiritually back then. When I was 21 years of age I was in a very bad car accident. The vehicle I was driving was sandwiched between a car and a van almost simultaneously and I then crashed into a telephone pole head-on. The driver of the car that struck me blew through a STOP sign at about 35 miles per hour while she was looking for a contact lens in her vehicle. I was not wearing a seat belt and my car was totaled. At the age of 21 a man feels invincible and that, coupled with some bad medical advice had me in a back brace and back to work the day after the accident. I was told by doctors at the time that I had “sprained” my back and the brace would help. The brace only made things worse and for nearly a year I walked crooked. I have lost count of the number of times in the past two decades when I have re-injured my back, been unable to walk upright or been hospitalized with serious back problems. I have also seen every type of “expert” and tried every type of “treatment” without real success in terms of truly correcting the problems. Now that I am 43 years old, the injuries I sustained back then have begun to catch up with me and affect my health and my life very negatively. I recently signed up for the Back Program at the Natick School and after only one month into the program, I just know wholeheartedly that, in time, the issues I have had with my back will be resolved once and for all. Presently, I am practicing a special series of about six movements about five times per week. The series of movements was designed specifically for me by the International Team based on detailed information I provided them about my condition. After only about one month’s time, I can already tell that the movements are exactly what I need. I am experiencing the strengthening and re-alignment of some of the injured areas as well as some pretty amazing and powerful flows of energy and heat throughout the injured areas that I have never felt before. I can tell things are healing. I am certain that the Back Program is exactly what I need to correct my major body problems once and for all so that I can move forward in my training. For me, it’s like taking two steps back in order to take five leaps forward later on. It is a very worthwhile investment. Without our health we have nothing. Three weeks ago I started my program for my shoulder and upper back and neck pain. All my life I have had problems with my posture. Because of it I have lived with constant pain in my upper back and neck. 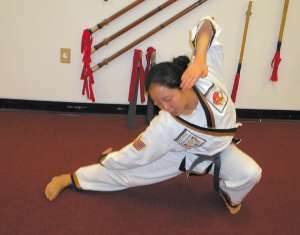 Then in September 2008 such acute pain started in my left shoulder that the discomfort disrupted my job and my ability to practice Oom Yung Doe. I could barely write on the white board and needed my students to help me. I sought hot packs, ice packs, acupuncture, deep message and medical help where my orthopedic surgeon prescribed extensive physical therapy. When he displayed my x-rays I could see the bony hook that had developed on my rotator cuff due to arthritis. My Doctor told me that eventually people like me have surgery to shave down the bone. I decided to invest in the program. The first few times I practiced the exercises they kicked the wind out of me. I felt completely drained, exhausted and I would shiver with chills. Then after a few days practicing the movements released a surge of sobbing emotion that seemed to spew from my shoulders, neck and upper back. I continued to practice and the movements either made me feel exhausted or make me sob. I cried either because of the emotional release or because the exercises had made my body feel unbelievably relaxed and comfortable. Feeling good was unfamiliar. It was like I had been in a prison my entire life and let loose without twenty dollars to find a room, meet my probations officer and start a new life. 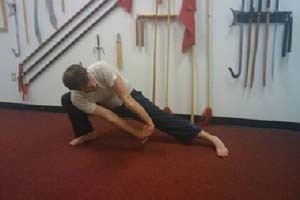 Now after three weeks of practicing these movements every morning I go for many hours with comfort. I have had to face some challenging situations this last week and I was able to do so without my neck and upper back developing a crippling spasm. I am now writing on the white board in the classroom again and I look forward to being able to practice movements in Oom Yung Doe that I have avoided for the last six months. “I would recommend Oom Yung Doe training to anyone most highly and without reservations and look forward to continued joint work aimed at optimizing our physical and mental facilities” – Sincerely I. Elman. I’m writing this just after returning from practice. I’m almost always more focused and clear-headed after a lesson, it brings me back to life after a long days work. I get more done starting at 9:00 or 10:00 after getting home from the school than I ever did getting home from work at 6:00 before I started practicing Oom Yung Doe. My life had reached a kind of dull stasis about four years ago. I was working a job that didn’t challenge me, provided no future and I wasn’t doing anything about finding something better. Having recently graduated with a Bachelor in Music, I was not pursuing any of my dreams with any sort of vigor, and I wasn’t seeking out new experiences or seeking any of the opportunities (musical or other) for which I had moved to Boston originally. I wasn’t depressed, I was just kind of floating waiting for something to happen I suppose. It was a classic wishing for something to happen and then getting distracted and trapped and forgetting to follow through with those goals. It also affected my relationships as I was also just floating through them, not challenging or seeking anything new out of them. Then one Christmas as a present I was given a 2 month program at the school in Davis Square. I had always wished to try some sort of martial art but again never actually followed through with it. I started noticing I had more energy after only about a week or two of practice, and I would start getting excited about going. I think I went 6 days a week for the first 2 months of practice before signing up for the degree program. In the last two years of practice in writing this I’m seeing how much I’ve accomplished. I now work the job I wanted originally coming out of college, which I credit to the incredibly focused energy I would have after practice allowing me to start writing music at 10:00 or 11:00 at night which was the only free time I had. I play in several other music groups around Boston, and most importantly have found some great relationships with friends and family. The reason I’ve been able to do all this is because I can see myself clearer and see the pitfalls that I would normally fall into. Instructors would always say that the practice room is the place to challenge yourself, and test your mental strength to carry on, because unlike the real world, there are no irreparable or painful consequences if you are not strong enough. I find this to be absolutely true. There is literature in my school with the translation explained as “forged in flame”. This always rang the most clear to me, as through the movement and forms I would be able to push myself further and further not through pain, but through giving myself good enough excuses to stop. Each time there was a seemingly brutal Pal Gae practice, I would feel the swirls of excuses, pain, and every other thought I had during the day start to form a barrier where my mind would inevitably have to crash into. However, each time I could break through and find my focus and find the strength to keep my breathing, keep my eyes, and keep my thoughts clear, I would leave the practice room with an overwhelming sense of pride and warm feeling, even if I couldn’t really walk very well. That strength has carried outside of my movement, I started to notice this when I would work 5:00 in the morning to 6:00 at night, and then go to rehearsals from 6:30-1:00 in the morning for 2 to 3 days in a row for about 2 months. I would normally start to feel sorry for myself and quickly build up a lot of stress and a negative shroud around myself hoping for other people’s sympathy at how hard everything was, but that was not the case. With my practice I still had plenty of energy, I never got sick during that period, and even though at that point in time I was still working the job I despised, I kept a very positive outlook and was able to manage the stress. I feel more human and more natural than I ever have, and I feel more connected to others than ever before, and that is why I keep practicing and plan to continue. After going to the weeklong and practicing the meditation practice, I’ve discovered a new feeling. I have never felt any sort of connection to something greater, believing that everyone was detached from each other. 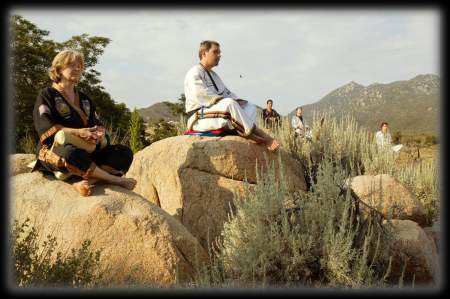 In my meditation I started trying to connect with nature, and meld into it. After about two weeks of the meditation, one night I had some sort of epiphany. I envisioned myself sitting in a forest by the water, and I removed everything that was not in a state of nature from my mind. I could feel other life breathing, with the thought that we were all put on this planet with nothing, and we would eventually all leave, and that was something that every living thing shares. With this bond I felt a sense of comradery with other life, and I felt an energy surround that. I then suddenly and completely relaxed like there was a cool breeze that just washed everything in my head away, and there was absolutely no stress. I started breathing, breathing that energy into me, allowing it clean me, and each breath felt like I was becoming more and more with the trees I was sitting by. I can return to this peace now each time I meditate depending on how much time I have. This is one of the reasons I want to teach other students. I am coming around to realizing that there is nothing else as important as the bond we all have with each other. To be able to heal and help another’s health is more important than anything else. Teaching also teaches me more about my character than anything else I’ve ever done before. It challenges me to challenge others without letting them give up on themselves, which is a problem I’ve always had. It also challenges me to have confidence I’ve not previously had. I am also better learning how to connect with people, and how to reach them through teaching them movement. Some of the best feelings I’ve had have been after a lesson where I’ve given a hand. The training I have received has been remarkably efficacious. The learning environment is positive, challenging and highly supportive… I have increased energy, reduced stress, a clearer focus and a healthier perspective. 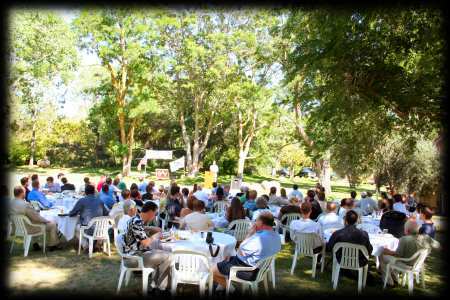 …3 hours had already gone by yet I was very energized. I find every time I attend a Sae Gae MooDoe seminar my mind and body become moreharmonized, and, at such an accelerated rate. I turned 47 and after years of ignoring my health I found myself over weight, out of shape with my cholesterol at almost 400… I had a check up at my doctor, after being in the program for only 10 weeks. My doctor asked me what I was doing differently. Not only had I lost 10 lbs, but my cholesterol was down to 246 and overall I passed my physical with great results. Even if it was not for the monetary gain, Oom Yung Doe would still be the best investment I have ever made in myself. Best of all, I now have the energy to play with my children. Middle age will have to wait for a while longer! …I even began to run again. Each morning I would run 2 miles down the beach to get my body moving in the morning. I had run in high school and college, but was unable to run after Fibromyalgia set in. Again, the training that Oom Yung Doe was passing on to me was working and healing my ten years of pain… I am stronger than ever… even stronger than I was before Fibromyalgia. I also found all the challenge and potential for growth that I could ever have wanted – in mind, body, and spirit. Through the training, I’ve gained a lot of self-discipline, will-power, and inner strength. 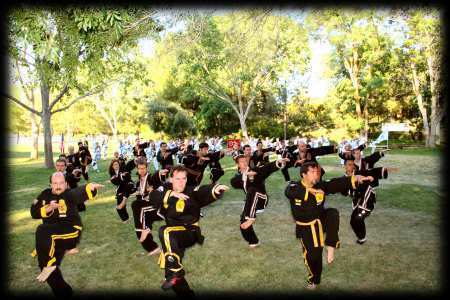 Oom Yung Doe is the third martial arts school that I have attended and by far the best. The other schools had their attributes, but they didn’t help my health, mental state, and physical condition like Oom Yung Doe. …my body and mind are now improving rather than deteriorating as I grow older. That is a rather remarkable thing! My body is becoming more flexible, stronger and my mind is more at peace than I have felt in many years. As a side benefit, I’ve lost 30 pounds without even trying to lose weight. …I was unable to enjoy watching my daughter as she grows, or my husband as we move through each stage of life together. I’ve made so much progress with Oom Yung Doe that I can now look forward to a better quality of life with both of them. Even more startling is how much I can use my body – bending my knees, circling my upper body to the floor and over my head – things I have not done since high school. 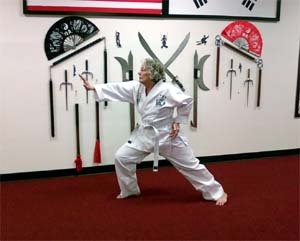 Branching out beyond Tai Chi, there are many movements I am practicing that have benefited my condition. I am aging well-free of arthritis and with great energy. The better care I take of myself, the better care I can take of others. I have a quality of life I cherish and look forward to continued achievements and knowledge with the help of Oom Yung Doe. I have become an independent women doing things as much so, that my husband no longer has to take care of me. I slept better the first week than I’d slept in years… I can’t explain how much Oom Yung Doe knowledge has helped me. What I’ve put down here is just the tip of the iceberg. I can’t express what it’s like to live in pain, every minute of every day, and then find it gone. Now, after two months of almost daily sessions….What can I say? … (many days, I feel like I am in my mid-thirties rather than in my sixth decade of life). I no longer “waddle” and can “skip” down the aisles at my local grocery store. Better still, my energy level is higher than ever, my outlook is positive. There are many benefits I have gained in my training: flexibility, strength, and determination. But, I would like to share with you why I decided to be come an instructor. Every time the ILT team is in town, I am reminded of just how deep True Moo Doe movement and principal is. After my MIP and 1st degree lesson, my body feels balanced and relaxed, and my mind is peaceful and calm. The lesson taught me how to connect my body’s movement, and helped me to focus and put my concentration back into my body. I am greatly honored and privileged to have found this source of Moo Doe wisdom. Thank you. After a 3,000 mile drive and a three stop return flight which got me into Seattle at midnight I was apprehensive about today’s lessons. My body was stiffer than usual and my mind was exhausted. Today’s lessons sharpened my mind and rejuvenated my body. I am very glad I was able to be back in time to be taught by the International Team. I can see and feel how these movements all link together to give me the middle body strength and flexibility. I can feel the tightness in my lower back where I still need more flexibility and development. I appreciate the continuous challenge to my mind and body that Oom Yung Doe provides. During this visit I found areas where my hand-eye coordination can improve. Having been a student for 3 years, my dexterity has noticeably improved, but when I feel that it has Plateaued, there is always something to challenge me further. Getting rid of negative, illuminating positive, that says it all. More speed and flexibility (including my personal movements), delightful class. I remember taking my first several Sae Gae Moo Does. It was difficult to follow along and it was mentally draining. 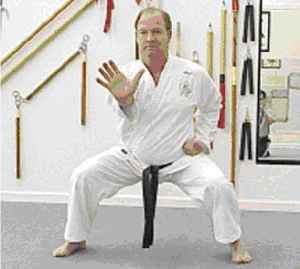 Now after a little more than a year of International Degree Training including several Sae Gae Moo Doe lessons, I was easily able to follow along with the Kom lesson without the physical and mental fatigue I experienced as a white belt. The ability to mentally focus while I am tired has allowed me to accomplish more of my life goals during the last year than I have accomplished over the previous five years despite a much more demanding job. Since beginning practice, my mental clarity, focus and energy have increased dramatically. I’m no longer as easily distracted in class and at work. I can sleep less if necessary and I leave lessons feeling more energized than when I came in. I am beginning to understand the purpose of National lessons. The total amount of Moo Doe wisdom spans several decades. Each Instructor present contributed to the lesson profoundly yet simply. From being utilized for the purpose of demonstrations to my personal training itself. This lesson made a positive difference in my understanding of my body. I was amazed by how well the instructors were able to identify the areas that the individual students were having trouble with and then show them ways to improve. After a two hour lesson I feel that I know the form we went through as though I have been practicing it for a week. Felt the instructors gave very personal attention to me. Make me feel that they see a potential in me, and are helping me to find it. Their approach gives confidence, and helped me to relax in the session. I’m very happy to be a student of this school. It make me feel stronger, happy. This lesson helps me to understand movement better. My ILDT Lessons are always a big learning time for me. I gain a deeper understanding of the principal behind the movement and of my training in general. 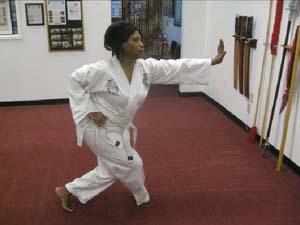 With each lesson I have seen my stamina increase, my ability to move and remember the movements also increases. At the end of the lesson I feel re-energized and in a very positive mood. In this lesson I really felt my body move in ways it had never moved before, my mid section flexibility, and hips and back were challenged. This was good because these are areas I would like to improve. The instruction increased my understanding of my movement. Thank you for everything! I thought that the 5th lesson was very fun and I got a lot out of it. The form and the breakdown of forms / pace of the class was perfect. The amount of information regarding application was well balanced. My understanding of the forms / movements are becoming more meaningful to me, mentally and physically. The instructors were both kind and patient. After coming back to practice from a 2 month injury, I was slow and rusty. They made special time on my behalf to teach me. They worked with me to help me improve my internal strength and to help me get back into a practice schedule. I truly appreciate the time and efforts of the instructors. They are great teachers. This round was an experience that allowed me to begin understanding what or how to use internal strength as well as mental concentration as compared to physical ability. I’ve really improved my flexibility and range of motion. I’ve also noticed an increase in determination and focus. I received some great tips about alignment – moving in a line. I feel stronger and more clear on the self-defense aspect. I learned a lot about combining movements and attacks together. I feel that I understand the attacks more. Challenging. Each time we went through sequences I was able to do it better. Greater Strength. Kay S, 53, 3rd SectionYuk Kun Kyong showed my weaknesses and how to change them. I look forward to practicing the form. Thank you. After the lesson I felt energized and ready to keep practicing. At one point I looked at the clock and was surprised at how much time had passed. Thank you! I enjoyed this Sae Gae Moo Doe and working with Kom. The pace was perfect and dividing the group with more instructors is very helpful. It was very useful for me to have several students go through movements at a time as its easy for me to not really have the movement. Thanks so much! The distance covered from the beginning of the lesson to the end is incredible. I have a good foundation of movement to build on and practice with. I look forward to seeing where I at in 3 months with the movement I have learned. I enjoy these lessons. It was not easy, but better than the 1st SGMD. It was not easy because to follow the movement was difficult, but I can se my ability catching up with the movement. 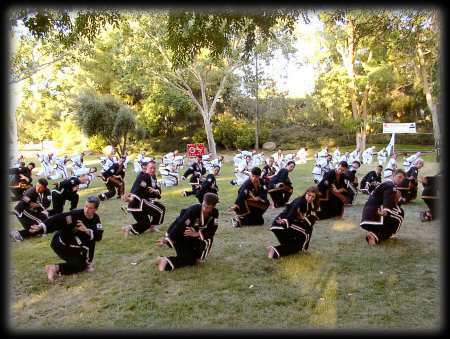 This Sae Gae combined breathing techniques with physical forms that were taxing, but together they seemed to complement each other. The breathing made the forms less taxing. At the end of the lesson I actually felt more relaxed and not as physically drained as I often do in other forms of training. I was able to do this lesson to the best of my ability and enjoyed it greatly. Hopefully I can take some of the lessons learned to help me relax in my other lessons. The International Teaching Team has a way of explaining the principles of a movement in a way that makes it seem extremely simple, so simple, in fact that I was left wondering why I didn’t see it before! Now that I do see it, I can also see my next step in my movements and can see my training more clearly than ever. I have been training for nearly a year and have never felt better than I do right now, I am stronger and far more confident than I have ever been. As a nanny of four, I was discouraged to realize at 22 years old I was having trouble keeping up with the kids. Now after 11 months of training, the kids can’t keep up with me. As well as the changes I have experienced physically, I have noticed a change in how I view things. I was very much an “I Can’t!” person for the majority of my life. I didn’t have much faith in my abilities, and was often second-guessing myself. Since I began training I noticed little by little that I was becoming much more of an “I Can” Person. If an instructor told me to do something, I no longer hesitated or wondered if I could do it, over time I just did it. Whether it was how high I could jump or how low I could get into a position I learned to trust my instructors as well as myself. This quickly spilled out into my life helping me to become more of the self-sufficient, confident woman that I now am. 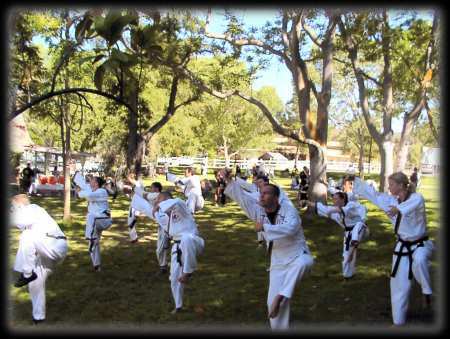 What most impressed me about Oom Yung Doe was that not only was I learning from skilled instructors, I was also given personal attention and instruction from Regional, National and International Level Instructors. 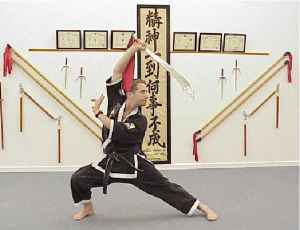 Of all the martial arts that I looked into and attempted there were none that offer so much. I have had the privilege of attending three International Level lessons since I began training and have been amazed at what I have learned. Each of the instructors knows who I am and where I am in my training. This multi-leveled attention and guidance has been a key factor in my progress as a student over the last eleven months. I can’t wait to see what the next year of training will have in store for me. New sparring movement and new weapon movement. I enjoy learning both. The new weapon movement sunk into every level of my body. Very hard but enjoyable. As always, the Head National Instructors are great. I appreciated the teaching style of the International Teaching Team. Head National Instructors and National Instructors gave very precise corrections; they have an incredible ability to pinpoint the problem and communicate the adjustment with not only technical but also general insight. I really felt that the lesson was a valuable experience. At the International lesson I was astounded by the flexibility and fluidity of Head National Instructor’s movements. From that one lesson I felt I become less tense and more confident with many of my forms and movements. Although the changes the Head National Instructors made in my movements seemed so minor, it was clear that they translated into profound improvements. The International lesson is invaluable to students including beginners and I highly recommended it to anyone who can attend them. The lesson was amazing. I couldn’t believe how much different the same movements I had already been learning were when Head National Instructors demonstrated them for me. I could see how skilled he was when just a slight adjustment was made to my movements. I now have a renewed respect for the amount of time and commitment it takes to reach that level of mastery. I wasn’t sure what to expect in the International training lesson. 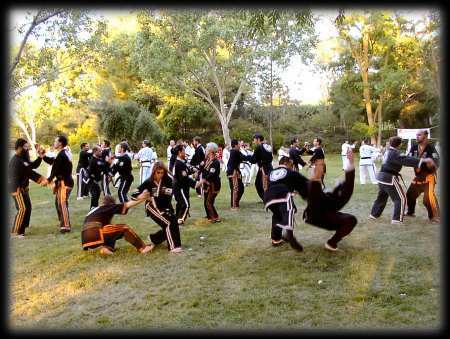 When I got there I was surprised to see that most of the people there had recently started practicing Oom Yung Doe. As a class we learned how to use skills we were learning and the instructions we received were specifically catered to us. After going to the lesson I had a better understanding of the self defense moves and feel confident using them outside if necessary. I had a chance to observe the power and speed of different movements and I hope someday to be able to achieve that level of skill. It always amazes me how incredible and detailed Head National Instructors’ movement is and how much I learn just from watching them move. Based on this first international level class I feel like my movements are going to be picked up a lot faster and stronger. I can see the difference already. Thank you, International Team, for this opportunity. I was terrified to think of doing three hours of training. Working with the Head National Instructors was an honor. They were very patient with me as I stumbled and tried to perform each movement. After each step, a little more was shown and I could feel the strength of the movement in the final phase of the technique. I was not exhausted at the end of the 3 hours; I was thirsty for more knowledge from the instructors. I look forward to the next lesson. During the international degree training seminar, I received personal instruction from Head National Instructors. This lesson and the attention to detail in regards to my personal development will greatly enhance my understanding of Moo Doe. I’m so glad I came today! I received a lot of personal instruction from Head National Instructors. I noticed much more flexibility in my stretching kicks, more stability in moving stances and greater confidence in my movements from the beginning of the three-hour seminar to the end. I look forward to continued progress in the coming months as I continue to practice what’s been taught to me today. I had the opportunity to learn movements directly from head national level instructors. I had a lot of personalized feedback. The head national level instructors helped adjust my movements and greatly increased my understanding of the movements and how they are applicable. The lesson was also very fun and informative. We did self-defense against 2 assailants, and really got moving smoothly in both directions-it was great. I discovered that I needed improvement in my strength and the Head National Instructors showed me 5 different strength building movements specifically targeting my weak areas. I also learned Sam Kyuk Su and some details to work on my Ton Bong. I was unaware until today of the specific areas where I needed strength and that strength was my weakest area. I was very excited by the opportunity to receive the personalized training available through the International Level Degree Training. The Head National Instructors observed my movement and were quickly able to see which areas needed improvement. They passed to me specific movements and adjustments to strengthen my weak areas and worked with me individually until I was able to pick up the movement. They answered all my questions and pointed out how the developmental movements applied to my forms as well as self-defense applications. It was clear from just one lesson how training under such highly qualified instructors would change me very quickly and allow me to achieve my training goals. I found the specific movements passed to me targeted some of the tightest areas of my body (hips and back). After just a few repetitions, I felt my body beginning to change. It even raised my kicks to a higher level. The movements that I received were perfect for my body at this time. I could really feel them and I know that with practice these will help me immensely. 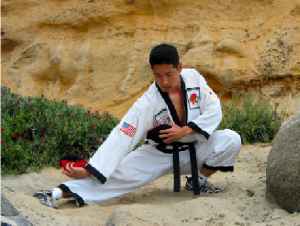 Due to past injuries, I was very limited physically and mentally until beginning training at the Oom Yung Doe martial arts school. Now, every movement and weapon I learn enables me and gives me the choice to live life fully, be physically active and mentally happy and alert. I am amazed at how caring and patient the local instructors and Head National Instructors are with myself and all my present limitations. In only three hours, we were shown a foundation movement for this graceful weapon. The instructors raised my concentration level and helped my fluidity of movement. Using the Doe is a very smooth and graceful form. It makes me focus my mind yet it relaxes me at the same time. I really love working with the weapon. And to learn from Head National Instructors is always a wonderful experience! I learned the basic skills on how to handle and hold the Doe. Then I was taught a series of movements involving the use of my entire body. We were given the opportunity to go through the movements in front of Head National Instructors and received adjustments. I felt great afterwards with a noticeable increase in energy. Practicing Sae Gae Moo Doe has already begun to provide benefits for me. I have become more aware of my target, and I am beginning to learn to be more relaxed in my movements. This training and the knowledge it will provide will have applications for my overall training and will help me in all of my other forms and movements. I have also benefited from the use of the herb. I have noticed that when my muscles become tired or stiff, re-applying the herb seems to reduce the stiffness and allow me to use more relaxed movement, which is my primary focus at this point. Applying the herb also seems to help improve my mental focus and concentration. 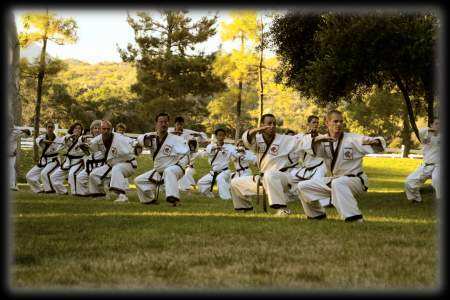 I wanted to tell you about my experience since taking the Koo Su Training. I attended this elective in Framingham with students from other schools. Being a 2nd section I found it to be a fantastic experience to be taught by some of the highest belt instructors in the country. Along with the Koo Su movements we were given an herb to apply to our hands and arms or anywhere else needed at the beginning of the practice. An hour into the lesson I realized that I had no discomfort or pain in my hands. Since I have the beginning stages of arthritis and I am missing the tip of my right index finger from a recent accident, I could not believe what was happening. The following day I practiced for three hours and again felt no discomfort, I was even able to strike with my finger tips with no pain. 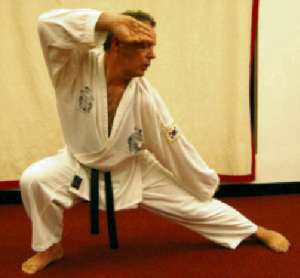 On the days that I do not practice Koo Su my hands are very stiff in the joints and my fingertip is extremely sensitive to contact. I have attended 4 follow-up classes and have practiced many times on my own. Each time the result has been the same, a long and pain free practice and the ability to now focus on the movement itself and not the pain. I hope that other students take this elective the next time it becomes available and find the same kind of benefit for their body. 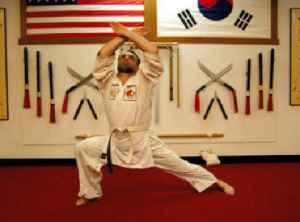 After the first day of the Sae Gae Moo Doe Chung Doe Level training seminar, my back was stiff and sore, to the point that I was wondering how I would be able to train the next day. Applying the herbal formula completely removed all soreness from the previous day. Then we started a more difficult training, practicing in a very low position. Application of the herbal formula relieved very quickly any tiredness I felt, and I felt light and rested and was able to continue with the high-intensity training. Every time the burning and soreness occurred, I applied the formula. The symptoms were quickly relieved and I was able to continue training for a couple of hours. The whole week after this training, I have had no muscle soreness or any pains. I feel my body became straighter, stronger, and I have an abundance of energy and focus for my work. I feel happy and eager to do and take on many tasks. It has been the most unique experience in one weekend of transformation of body and mind that I have ever experienced. The change is toward strength, centeredness and energy. Thank you. I got into the Bagwa Walk foundation movements about three weeks ago. I have been keeping a schedule of three times a week. The herb causes my body to loosen up instantly. I have noticed a few things from practicing the Bagwa Walk Foundation. One is the buzzing in my hands during the walk. I had felt that in Bagwa Walk before, but with the foundation movements the feeling comes much quicker and more often. Also, I feel more strain in my quadriceps than I remember in “regular” Bagwa Walk. I think it is because the herbs help my ankles loosen up, allowing me to challenge this part of my body more. I got into the Bagwa Foundation Seminar about 3 weeks ago and have practiced consistently since; it has become a mainstay of my overall practice. I have since noticed an overall improvement in my strength and movement. The associated strength movements are especially challenging and I see the benefits each time I practice. I have been practicing for over six years. 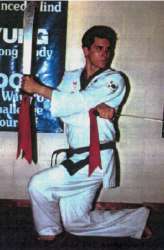 I began my martial arts training at the age of 39. In that time I have noticed fairly significant mental and physical changes in myself. These include but are not limited to increased mental focus and determination, weight loss, increase in muscle tone and strength, increased range of motion and flexibility. With the advent of my practicing with the Koo Su Hyung Foundation herb there have been some fairly striking changes that I had not experienced before. Physically, I have noticed that I feel energetic for a much longer period of time. With the continued application of the herb during my practice, I sometimes feel that I can go on for hours. I have also noticed a much more profound feeling of energy movement in and around my body, and that this can be directed more easily.However, the mental changes seem to be a bit more striking. Understanding of new movement and its application seem to come easier and my ability to concentrate for extended periods of time has increased dramatically. I am looking forward to continued mental and physical development. When I arrived for the Koo Soo elective, I was tired and had some sore muscles from attending the International Training Seminar the evening before. My left foot, which has bothered me from an injury several months ago, was swollen and throbbing. I applied the herb to my arms and decided to try some on my foot. Awhile after the class began, I looked at the clock and was surprised to find I had been moving for two hours and I did not feel any fatigue and there was no pain or swelling in my left foot. I continued to move for the remainder of the class feeling energized. I also felt I had more mental clarity. I was concerned after the class that I would be sore or stiff the next day and that the pain in my foot would return. I was quite pleased to wake up the next morning completely pain free. No sore muscles and no pain in my foot! This is a major achievement for a woman my age (51) and one that I attribute to the Koo Su herb. 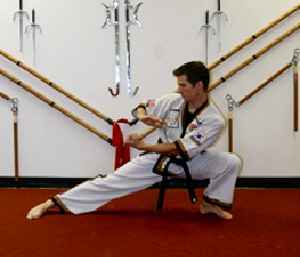 Note: Since practicing Koo Su, I no longer have a problem with my left foot. I recently attended the Koo Su (eagle’s beak) seminar. I enjoyed it very much — the movements were very good. With help of the herb I found it very possible to make it through the entire lesson without fatigue. The team of Head National Instructors was very helpful. I found it to be very challenging mentally – timing and focus was a big part of the lesson and came up very quickly. I look forward to attending more seminars like this in the future. Koo Su was an eye opener. The movement is extremely helpful. 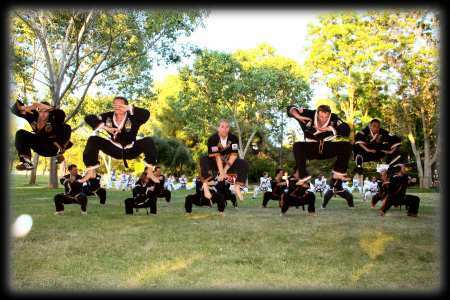 The “Eagle” movements actually have helped bring together rounding movements (back), stepping movements, and jumping coordination with precise attacks…. I feel that this has helped me to understand just how critical the different body positions affect movement and attack. I feel that I learned so much regarding movement. The herb has already helped. I had pain this week in my arms….funny but I thought after applying it…..it decreased quite a bit! Thanks again for the opportunity to learn and better myself. The key aspect of the seminar that appealed to me was being able to hit actual targets. It gave me a better understanding of my movement and how to actually build up my ability to use different Koo Su attacks. It was a privilege to participate in a lesson taught by the Oom Yung Doe Head National Instructors team. The combination of Koo Su movements and the herbal application allowed me to realize a higher level of both physical relaxation and mental focus. It was a breakthrough lesson for myself in the sense that I was able to relieve the unnecessary tension from my body to a much more relaxed state. By lessening the attention normally demanded by my physical movement, I was able to shift my focus to the mental aspect of the lesson therefore gaining greater understanding of the movements and it’s applications. The herbs effectively eased the fatigue in my body, allowing me to string the movements together with more fluidity and less effort. Moving with both relaxation and mental intent is no longer just theoretical wisdom. I now realize that this can be achieved at any level given the proper instruction, and I strive to duplicate it in every lesson. 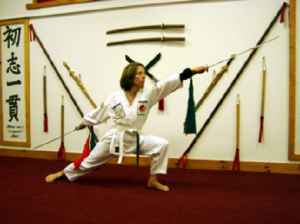 As a result of the Koo Su lesson, the mental and physical approach that I have toward my personal training has improved immensely. The follow-up lessons, I have found, are a necessary part of the Traditional Sae Gae Moo Doe seminars. I had been feeling tired and sore from the Hyung Foundation practices, but recently I went to a follow-up lesson and hit the herb bags. I immediately began to feel rejuvenated, warm and more alive. I haven’t felt this good in a long time. Many students have commented that the Hyung practice is physical and demanding. In addition, they are surprised at how challenging it is to strike the bags as if their endurance and physical stamina are being challenged more than the form had challenged them. 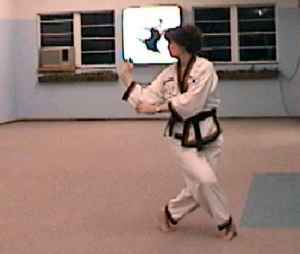 But at the same time, they also feel more energized during the striking. I have noticed that as they strike the bags, their body movement seems more unified. I, as well as other students they practice with, have noticed their physical movement (unification/ability) change as they strike the bags. I cannot believe that I can go through the whole day of training and my bad knee didn’t even bother me. In addition, I was able to get into lower positions than ever before. I am astonished that my whole body suddenly changed in just 2 days. It felt like something moved or opened up and my whole movement has changed. I practiced for three hours and wasn’t sore. When I put the herb on I felt my body start to tingle. After the lesson I was a little tired but felt like I had a lot of energy still. Also my senses felt more acute, my hearing was sharper and my eyesight was better. I liked the Hyung Foundation movements a lot. The personal direction from Head National Instructors made all the difference. I couldn’t believe that I made it through a three hour lesson and wasn’t aching all over. The seminar was my first. It was an awesome experience. The Head National Instructors are one of a kind. They gave me great insight into myself and what I am doing here. It was a powerful experience that I will never forget. The Nae Gong Foundation movements displayed results almost instantly. Although I cannot comment on the long-term benefits, I have noticed short-term effects. While I’m doing the Nae Gong movement, I feel warmth and tingling traveling throughout my body. The entire exercise seems to have a meditative effect on me both mentally and physically. I have also been applying the herb to my knee regularly and during the movement, as I was experiencing pain. Applying the herb while practicing the movement seems to further channel energy to that area. 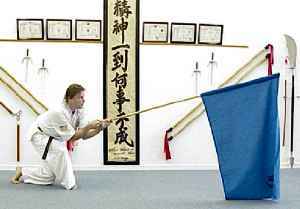 I can only imagine the benefits of practicing Nae Gong on a long-term basis. These immediate results have surely motivated me to continue and develop this movement. I first want to thank you for the opportunity to get into the Chung Doe Level Training. I am grateful for the knowledge obtained as well as the contact with the Head National Instructors. I’m already beginning to feel and see effects from the Nae Gong Foundation movements. I have observed increased circulation to my hands, with swollen blood vessels around my wrists and hands after practicing. During the movement with the bags, I notice areas of warmth, including my knees when I’m in a lower position, shoulders, and lower abdomen, depending on the part of the movement I’m engaging in at the time. Practicing the Kom should lead me to increased concentration and strength. Though I practice with these principles in mind, I mostly find it fun. 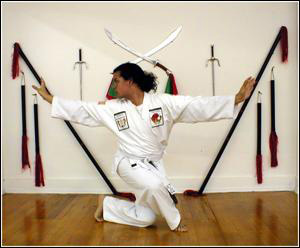 After taking the Nae Gong Foundation Training I thought I would be sore the next day. The first half (1½ hours) was continuous movement using the Kom. My arms and legs hurt quite a bit after these movements. 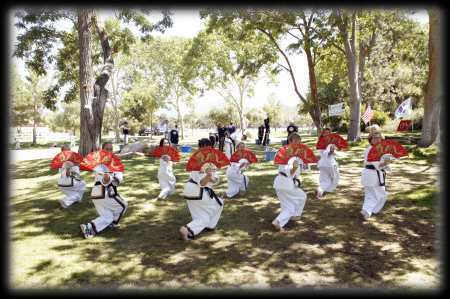 However, after learning the Nae Gong Foundation movements and applying the herb the pain was gone. I felt great and very relaxed. The next morning I woke up to find I was not sore at all, in fact I felt very good. The next time I practiced the Kom movements I felt some lower back pain again. After applying the herb and practicing Nae Gong the pain went away. I look forward to continuing my Nae Gong practice. I was very thankful to have the opportunity to get into Nae Gong. One definite thing I noticed from the practice is my energy level increased. I have practiced several times since. 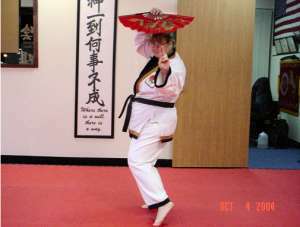 One night I was very tired from school and went through my Nae Gong practice. Afterwards I was completely energized and was able to get a lot done that night. It was also great to learn weapons movements (Kom). I find them challenging because I have to put a lot of focus into the movement. I found the training to be extremely beneficial. The combination of focus and movement is extremely powerful. This has already permeated into all areas of my training and has helped to increase my awareness. I find this very exciting since I am only just “scratching the surface” at this time. I have found that the Nae Gong herb is also quite beneficial. I even found that after applying the herb, after a somewhat grueling set of concentration positions, the herb seemed to relax and “go into” my legs…. pretty interesting. 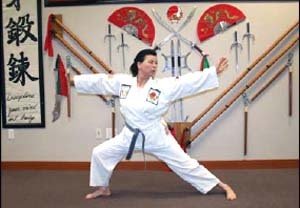 I’ve participated in 2 Chung Doe Level training seminars since I started Oom Yung Doe training 1 year ago. The foundation movements I learned help to strengthen my understanding of Oom Yung Doe and to point out the areas I need to work on. It has become a part of my regular training curriculum. I was also taught some advanced weapon forms. The instruction I received allowed me to grasp the advanced knowledge of these weapons and learning their control has improved my ability. I have been training in Oom Yung Doe for about 8 months and just one Chung Doe Level seminar has brought all the training I have received to a whole new level. I feel much more relaxed, and in turn I have become faster and feel much more confident. And that’s just from a few hours. I feel these seminars are an excellent opportunity to further one’s knowledge and understanding of Oom Yung Doe. After experiencing these seminars I will make sure to attend every one I have the opportunity to go to. The Head National Instructors are absolutely amazing. The grace, power, and control of their bodies is unbelievable. They have a power you can sense when they walk into the room. The detailed instruction they give will change every aspect of your training and will strengthen every movement you ever learn. I believe these seminars will truly change your life, and I would like to thank them for this. I feel honored to have learned from them. It’s something I will never forget. Chung Doe Level training is a great experience, and in the little amount of training I have received, I have learned a great amount. It has given me a chance to meet and learn from the Head National Instructors, which is an amazing experience. It gives you a chance to see all the potential in yourself, just by watching them. The training itself has already given me better awareness, mentally, and better balance physically. I have only been to 2 International Level Training seminars, and one Chung Doe Level, but have learned so much. It is a great experience and so beneficial to be able to learn new and different things that enhance and build on the everyday training I receive. International Level Training is the North Star of my training. It has guided me in every aspect of my thought and comprehension of my movement. 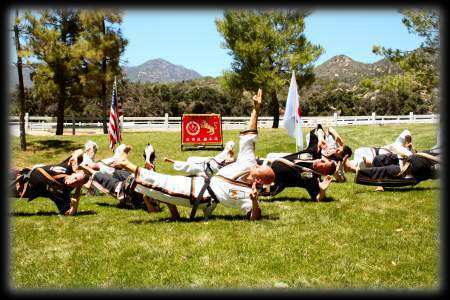 It is also amazing to witness the strength and knowledge that can be achieved, which I have seen the Head National Instructors demonstrate many times. When I first was fortunate enough to experience International Level Training I took everything for granted, and did not know what it had to offer. Now after attending the National Weeklong Seminar I found the mental and physical reason to my training, without it my life would not be the same. 10 year old K.T. 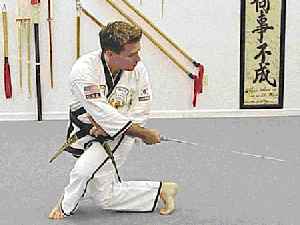 and 9-year-old J.G., plus other children suffering with Cerebral Palsy are gaining greater motion with your martial arts therapy. A therapist with Orlando Pediatric Multi-Therapy Clinic said ” the children are much more motivated with your program”.